Statistics show that the event management industry will grow by 44% and add over 30,000 jobs in the next five years. This is great news for all planners as it shows that the demand for your talent and service is on the rise. As an event planner, it is more important than ever to know how to write an event planning proposal in order to get the attention of all clients looking for qualified and professional event planners. A good proposal will help put you ahead of 95% of your competition. Mastering this skill can really help your business take off. Planning an event requires a lot of attention to detail, scheduling, organization and follow up. By presenting a well formatted event proposal or RFP, it subliminally shows your potential client that you have the skills they are looking for. Writing a good proposal requires the ability to understand all the fine requirements of the client. Part of the responsibility of a good planner is to create order and produce amazing results even on short deadlines. Clients are often times unorganized and nervous about their events. With your experience and professionalism you can make a huge impact on helping clients. Keep in mind that most clients do not know what they want. They are looking for the right event planning company with a vision to assist them in planning a beautiful event. Whether it is corporate getaway, retirement party, reunion, million dollar wedding or a small budget event at the kids birthday or family gathering, it all starts with a well written proposal that describes the event. 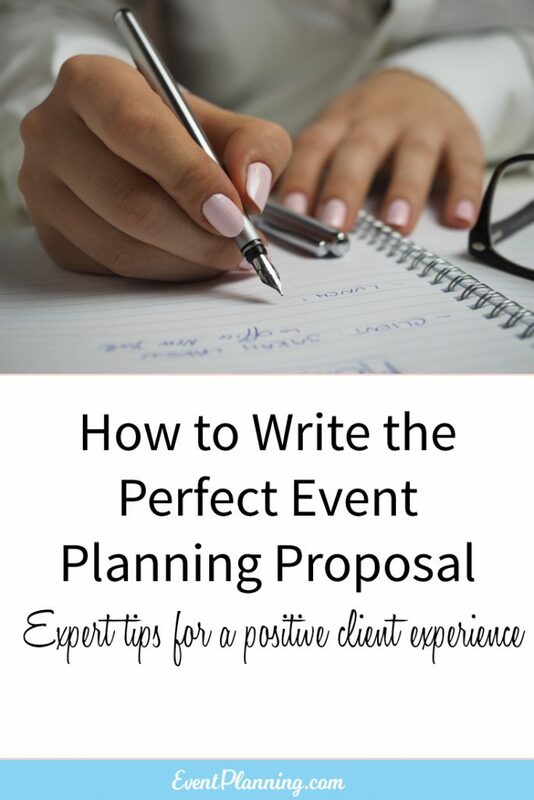 As a professional planner or a volunteer, you should be able to sell your skills to the client through a well-researched and well written event proposal. This articles outlines guidelines when writing an even planning proposal. Start by thinking about your biggest strengths as an event planner and write those down – now make sure those make their way into the proposal either visually (through photos) or through text. Even if you have an idea of what the client wants or you have planned hundreds of similar events before, the first step is having a one on one conversation with the client to find out what she wants or what she would like to accomplish during the event. During this meeting, take notes of all the logistics such as the time, desired location, date and any other key points. In addition, listen to her/his ideas for the catering, color scheme, theme and other visual elements they would like for the event. Do not write an event planning proposal that reads like a formal letter. The proposal should speak directly to the client needs that you observed during your meeting. Keep in mind that you are writing the proposal specifically for your client so talk less about yourself and more about their desires for the event. Keep in mind that your client is probably looking at a couple of other proposals from different planners and they will pick the one that best understands their needs. Also, ensure that you include your company logo and contact information on the cover page. The proposal title is also very important especially if you are proposing for a specific company. You want to customize the title to your specific client so they do not think you have a template you use for all clients. You can summarize your client’s needs in the title of the event description. It serves as a summary of all the client needs as well as the client’s goals for the event. When a client sees this information right away it brings them reassurance that you understand their desires. If you have any photos of similar events you’ve done that accomplish things that this client wants, you can include those photos in the portfolio section of the proposal. The description is generally where you repeat what the client told you about the event but in a more professional and organized way. This shows that you fully understand what they are looking for. You should also strive to give more helpful suggestions than what the client asked for. You do not want to overwhelm them but you can look for other options that you think the client may like and are within her budget. You can also include images of the venue locations which enables the client to see exactly what they are getting and also gives you a better chance of being hired as most of your competitors are likely to send boring non-custom word documents. A brief summary of yourself or company is important when writing an event planning proposal. It gives the client an idea of who you are as well as how long you have been in business. If your client has to get approval from their boss about hiring you it is good information for the decision maker to see. Include your capabilities, brief information about your experience as an even planner and past customer client work that you did a good job on. In case you do not have much experience planning events yet, you can mention any internships, volunteer work, coordination or project management experience in any other field. We have seen many event planners with less experience land big clients by having an amazing client proposal so do not let a lack of professional experience scare you. Ensure that you also mention any other relevant experience or training that you have if you do not have too many hands-on events under your belt. Following the above information, the client will want to know the services you can offer during the event. If the event is extremely large with multiple functions such as a wedding, formal presentation, dinner party, it is appropriate to have headings for each function then indicate what you can offer in each function. For example “luncheon” or “cocktail party” then describe the duties you will perform in that function to make it amazing such as hiring staff, ordering and serving food, setting up the tables. In case it is a smaller event such as groom’s dinner, baby shower, you might consider creating a bullet point list of your duties as well as the vendor and location you will use. You can attach photos of a similar event you have done in the past to help the client get a clear picture of what you can offer. In this section you should summarize the event in 1 – 3 sentences and then have sub-headings for each part you will take care of. Then you can have sections for Catering, Decorations and Set Up, Event Theme, Open Bar, Music, Entertainment, Registration, Event Break-Down and Clean-Up. In each of these sub-headings you should have a couple sentences about what can take place and an approximate cost for each item. The cost for each item should be the total amount you will charge the client. If you mark up the vendors then be sure to take into account your markup; or if you pass the cost through as is then you can include that amount. You can read this article for help figuring out how to price your event planning service. Naturally, all clients will look at any event planning proposal in hopes of seeing how much it will cost them to hold an event of their choice. After describing the event in a way that a client can taste, smell and see how amazing it will be, create a section to summarize in detail all the costs or each item as well as their purpose in the event. For example, a client might not know the use of a sterno (it helps to keep food warm throughout the day) so if you list that in the proposal make sure you define it. At the bottom of the sheet, make a detailed computation of all the costs. It can also help to provide any perceived discounts such as discounts for early booking or discounts for multiple bookings at the same time. You want to give yourself an advantage over the competition. You can end the proposal by having a page about your policies. This helps to manage your client’s expectations properly. The sections of your policy that you can include are a Minimum Guaranteed Headcount; Limited Time Offer on this particular proposal (typically 60 days); Cancellation Policy (no cancellation within 15 days of event or client only receives 50% refund); Rental or Damage Policy; Payment Due Dates; etc. Finally thank the client for the opportunity and remember to provide your contact information; phone number or email address so that the client can contact you. If articles like this are helpful to your event planning, you will enjoy our full "Become an Event Planner" course. For a limited time you can try the full course for only $7 (regular price $295). This limited time trial includes proposal samples, 23 free bonus templates, and contracts; as well as 11 modules and weekly projects to help grow your business. This is so true. I’ve been writing these up for 6 months and it’s awesome how well these work. Clients have often told me that my RFP is what got me the gig over the competition. I’d love to see a proposal of your RFP. I am interested in becoming a party planner. Can I please have a sample of your event proposal? Awesome explanation and email about this. Would you share if you use a template for your RFP’s? These details are helping me create a proposal for pitching a big venue in town. It will be my biggest event if I land it. I’m nervous but thank you for the tips. So helpful! Thank you for your useful information & it will be highly appreciated if you can send me a sample proposal. Pls give a sample of event planning proposal file…. we are planning an event basis of charity and fun for people for free entry…. Is there a way to get a sample of the proposal letter? Is it possible if you email me one of your sample proposal? Cause im doing this one sports event. So im a bit insecure about my proposal scared if its not detailed enough..
Is here a way to get a sample proposal. I am quoting the largest fundraiser for me to date and I want to put together pricing for both hourly and fixed rate to give them an option thank you! Wonderful, I’ll be so glad if I can get copy of this proposal too. Thanks for this informstion. Would you please send me a sample template. I look forward to learning. This information is very helpful. Can you please send me a sample template of a proposal. Thanks in advance. I love this Please email me a sample proposal. Is it possible for me to get a sample email of the proposal please and thank you? Can I request copy of a proposal based on the above’s suggested good practices? Thank you! could I get a proposal to a school to plan their Children’s Day Event. Can you send me a sample proposal please. This is so helpful. I am currently in a catering class at a local college and have to write up an event proposal for a project. Would there be any way you could email me a template of a proposal? I would be so grateful. Thank you for your time and effort in putting this all together. May I have a copy of the sample proposal to my email? Thank you in advance. I had no idea how to write an event proposal before but thanks to this article for its breakdown, it is no longer as hard as feared before I read the article hence I’d like to say thank you very much for sharing. This is very helpful. May I also have a sample proposal template sent to my email. Thanks! Its beyond helpful, the steps are so explanatory, thank you so much.